Every manufacturing country has its ultimate dream bike, like the eight-valve, four-port Harley, the British Brough-Superior SS 100, the German supercharged BMW or the Italian Guzzi V8. For the French, the ultimate bike is the 1000cc Kœhler-Escoffier. When their famed "Mandoline" 500cc single could be developed no further, Raymond Guiguet began designing its replacement, an overhead-cam single, in 1926. His company's feeble finances compelled him to economize on foundry patterns. The cylinder castings were also designed to serve as a 1000cc twin-cylinder derivative. The V-twin used as many components of the 500 as possible: the shaft-and-bevel-driven overhead-camshaft and twin-port head. The rear cylinder was simply turned back-to-front to give the tailpipes a straight run. The first 1000cc V-twin was entrusted to Edouard Grammont, who had raced under the pseudonym of "Eddoura," and achieved outstanding times hill climbing highly tuned "Mandolines." The 1000's first outing was a disaster; at the second Eddoura won the Planfoy hill climb, and in the third, at Laffrey, he beat the talented works rider Rolland's 500 Terrot by over 22 seconds. The fastest time that Eddoura achieved was 69.5 mph at Gaillon in 1927, giving him second place in the motorcycle class. To put this speed in perspective, the fastest car at the time could do no better than 54 mph. 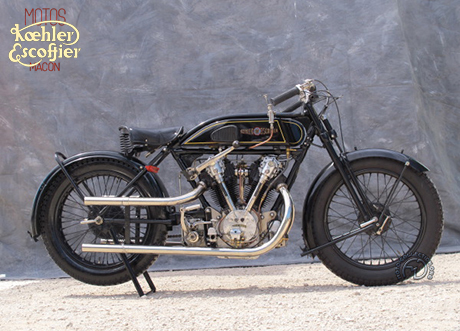 The sole surviving example of the near-legendary 1000cc Kœhler-Escoffier reappeared in 1992 after a meticulous restoration that had taken years.